Although Latin American and the Caribbean region have contributed relatively little over the years to greenhouse gas emissions, they are highly vulnerable to the effects of climate change. Latin America and the Caribbean only produce 5% of global emissions of greenhouse gases – yet its contribution to global figures is increasing due to the industry and transport sectors. Multiple studies have shown that over half of the region’s population lives in places with high or extreme climate vulnerability risks. These risks include damage to infrastructure, changes in crop and harvest cycles, and human losses caused by natural disasters. In Latin America and the Caribbean, the main source of emissions is the energy sector (including electricity and heating, manufacturing and construction, and transport), which accounts for 42% of the region’s total emissions. The energy sector is especially vulnerable to climate change, because its hydropower depends on precipitation. The transportation sector is currently responsible for more than one-third of the carbon dioxide (CO2) emissions in Latin America, and is the fastest growing sector. The International Energy Agency projects that worldwide CO2 emissions from vehicles will increase by a factor of 2.4 (or 140%) from about 4.6 gigatons in 2000 to 11.2 in 2050. For this reason, urban transport represents a key sector for long-run greenhouse gas mitigation efforts. China remains the largest emitter of CO2 worldwide, followed by the US. 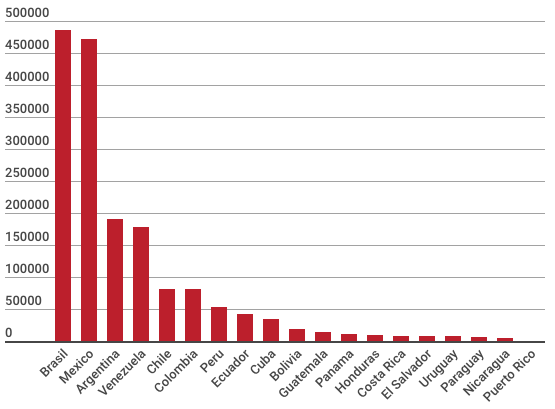 The Latin American country with the most emissions, Brazil, is the 15th in the world (emitting 486,229 kilotons of CO2 annually), followed by Mexico with 472,017. Below is a short summary of how Brazil, Mexico Argentina and Costa Rica have committed to reducing their emissions, in Paris Agreement jargon their Nationally Determined Contributions (NDC). Brazil’s targets have been rated “insufficient” by Climate Action Tracker, meaning that they are consistent with increasing global warming between 2 and 3 degrees. The Brazilian goal is to reduce emissions by 37% by 2025 compared to 2005, and 43% by 2030. Brazil’s main sources of emissions come from the forestry and land use sector: with deforestation reductions since 2005 it has already reached the goal of 37%. Nevertheless, deforestation and resulting emissions have begun increasing again in recent years. The 2018 elections have moved Brazil further away from increasing its climate action and from fulfilling its commitments under the Paris Agreement. During his campaign, Jair Bolsonaro spoke against climate change and the deforestation of the Amazon. Mexico proposed to unconditionally reduce combined GHG and black carbon (BC) emissions by 25% below business-as-usual by 2030. Mexico also plans a 40% reduction of GHG and BC emissions by 2030, conditional on certain requirements for global agreement and international support. Mexico recently reformed its General Climate Change Law to include its Paris Agreement commitments on a sectoral level, as well as its long-term adaptation and mitigation goals, and to establish a national emissions market—which was previously only voluntary. Despite that, Climate Action Tracker also rates the Mexican NDC as “insufficient” and suggests that the country will not meet its emissions reduction targets for 2020 and 2030 and will need to implement additional policies. The new president of Mexico López Obrador, affirmed that his government would not allow fracking, but in contrast, recently he announced his government plans to reinvest in hydropower and increases oil production by 33% to 2024. Argentina’s new goals include an unconditional absolute emissions reduction target limiting emissions to a 35% increase compared to 2010 levels (excluding what is sometimes called “LULUCF”: Land Use, Land-Use Change, and Forestry). Argentina has also put forward a conditional target to limit emissions to 369 MtCO2e/a by 2030 including LULUCF (322 MtCO2e excl. LULUCF), which equals an increase of 3% compared to 2010, levels excluding LULUCF). Argentina’s economic crisis has led to changes in the structure of ministries with the objective to decrease government spending. Included in these changes are departments dealing with climate change. It is unclear whether the structural change will have an impact on climate policy. The Argentinian government promotes renewable energies on the one hand, but at the same time in the last year decided to move forward with the exploitation of oil and natural gas from non-conventional fields, such as Vaca Muerta. As I mentioned above, Latin America and the Caribbean have made a historically small contribution to climate change but they are highly vulnerable to its effects. These and other developing countries will need funding for climate change mitigation and adaption in the coming years. The next COP25 will take place in Chile, where the main aim will be to thrash out the final elements of the Paris rulebook and begin work on future emissions targets. The most vulnerable countries are demanding stronger efforts from developed countries. Huh? He said he doesn’t believe climate change is real and he proposes to let miners and ranchers have a free hand in the Amazon. He thinks indigenous peoples have been unfairly coddled and should not be allowed to stand in the way of development. He has appointed a climate denialist as Foreign Minister. The environment ministry will be abolished and its functions given to Agriculture. It’s as bad as that.